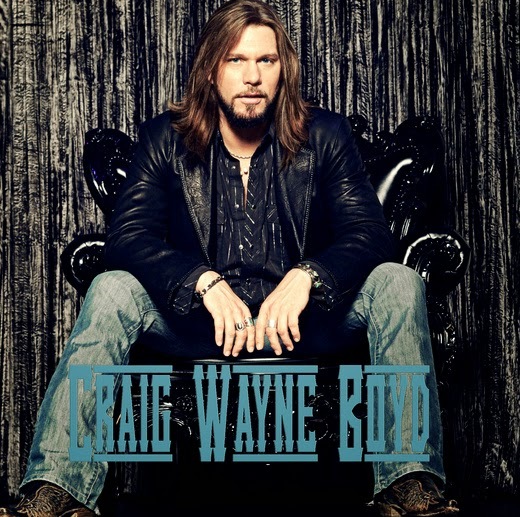 We've been huge supporters of Craig Wayne Boyd since first being introduced to him by a mutual friend about 7 years ago. We saw the talent, the charisma, the humility and the tenacity that we knew one day was going to be seen and appreciated by the right people. We've seen him struggle, paying his dues day in and day out just to get his name out there and gettting his music heard and we've seen him walk a hard road, coming close to throwing in the towel on a career in music.The decision to take one last chance came in the form of an audition for one of television's hottest musical talent shows, "The Voice" on NBC. Well, they say that the results you work so hard for usually happen just when you've lost faith and are ready to give up and that the only chances you regret are those you don't take. Taking that chance paid off last night when Carson Daly announced Craig, the "Comeback Kid" and last man standing member of Team Blake, as this season's winner of "The Voice". The years of struggle and hardship paid off in spades with this win, putting Craig on a brand new path paved with opportunity and recognition in the industry. Craig is one of the best selling contestants from "The Voice", with all of his performance singles breaking the Top 25 on iTunes in the all genre charts and claiming the #1 spot on the iTunes country charts with his emotional rendition of Johnny Cash's classic "Walk the Line" and his heartfelt version of the spiritual hymn, "The Old Rugged Cross". September 30, 2014 - Sporting his signature fringe, Craig walked out onto that stage, belted out Travis Tritt's "The Whiskey Ain't Workin' Anymore" and turned around the chairs of coaches Blake Shelton and Pharell Williams, eventually choosing Blake as his coach. October 13, 2014 - Craig goes head to head with another strong country artist, James David Carter, in the Battle Rounds performing Pat Green's "Wave on Wave". This round resulted in Blake choosing to keep James which put Craig on the chopping block, but a last minute save by Gwen Stefani, put Craig on the path to the title with a makeover to a "modernized" look including less fringe and a new haircut which also seemed to give him a noticeable burst of newfound confidence. November 3, 2014 - Craig advances to the Knock Out rounds, performing "Can't You See" by the Marshall Tucker Band. This performance resulted in Gwen choosing to give him up, but Blake's last minute surprise steal brought him back to Team Blake and kept him in the game, with the Live Playoffs being the next week. November 10, 2014 - Craig wows the crowd with a rousing rendition of "Some Kind of Wonderful", gaining momentum to move on to the Top 12! November 17, 2014 - He's made it to the Top 12! His song choice of George Strait's "You Look So Good in Love" made a huge impression on viewers and the coaches alike, moving him on to the next round. This performance proved that he has the new voice that could bring country music back to the basics. November 24, 2014 - Craig's Top 10 performance captured America's heart with a stirring tribute to his late friend and fellow musician, Wayne Mills, with an emotional take on the Johnny Cash classic, "I Walk the Line". This performance made it to the top of the iTunes country charts and to the Top 10 iTunes all genre charts. It also cemented his position as a true contender in the Top 8. December 1, 2014 - Craig's Top 8 performance of the Eagles' hit, "Take It Easy" made it very easy for America to vote him on to the next round, the Top 5 semi-finals. December 8, 2014 - Craig had 2 performances tonight in the semi-finals. His first performance was THE performance that really gave Craig his push for the title, taking a chance on God and bringing a deep and meaningful performance of "The Old Rugged Cross" to America during a time we really needed it. This performance stirred emotion in everyone and took him to the top of the iTunes charts and straight to the heart of viewers. His second performance of Merle Haggard's "Working Man Blues" kept the momentum going right on to the finals. December 15, 2014 - Tonight was it, part one of a two night finale, his last chance to shine and get those votes. He got them with his 3 performances - his first performance was the original song, "My Baby's Got a Smile on Her Face" which was a song that Blake Shelton had for years and never cut, deciding that Craig's voice was the right voice to record it. The song also came with a chance to put out a Voice first, a contestant video (shown at the end of the article)! His second performance was a duet with Blake Shelton of "Boots On", an energetic song by one of our favorites, Randy Houser. His third performance brought out the tissues, Alabama's "In Pictures". If you didn't cry during this performance, knowing Craig's relationship with his young son, Jaxon, you have a black heart. 3rd runner up? Chris This left Craig and Matt McAndrews, who gave some serious competition from day one. You could feel the anticipation and see it on both of their faces, you could almost feel their hearts pounding as they waited to see which one of them would be named the winner ... The winner is ... CRAIG WAYNE BOYD! Many thanks to fans who showed patience and braved busy phone lines to get their votes in, who voted using the smartphone app, Facebook, Twitter and who purchased each contestant's music on iTunes. This was a great season, anyone's game with amazing talent. I'd say the best talent since the show began. Be sure to keep supporting Craig by signing up for latest news updates on his website - www.craigwayneboyd.com, liking him on Facebook, connecting with him on Twitter, and by purchasing his music. Request his new single, "My Baby's Got a Smile on Her Face" which has already hit country radio! Thanks to your support, Craig is on a new road to being one of the next big names in country music and a new life for both he and Jaxon. Thank you ALL for your support! It's been one hell of a ride and hang on, because it's just gonna get better from here!